Bok choy is a Chinese green-leafed vegetable that's similar to western cabbages. Also known as pak choi, bok choy has green, spoon-shaped leaves sprouting from a wide, succulent white stem. Both parts can be used in culinary preparations. Add uncooked leaves of young bok choy to salads, or cooked stems and leaves to stir fries and soups. 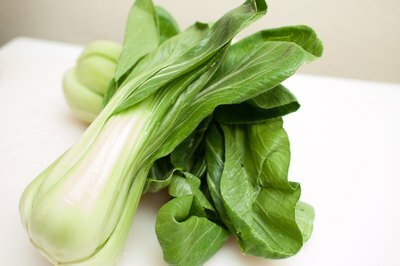 Bok choy is a good source of vitamins A and C as well as calcium. 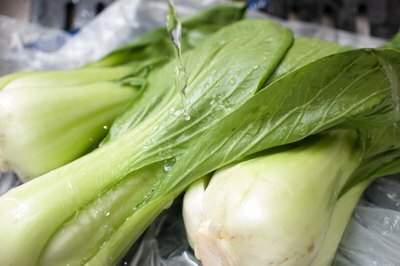 Wash your bok choy to ensure that there is no residual dirt or dust on it. 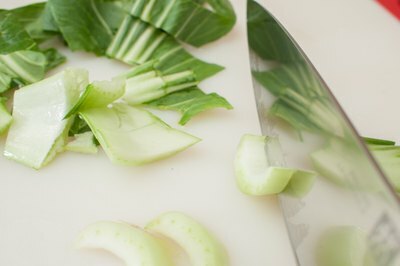 Lay the bok choy on the chopping board and separate the leaves from the stem. Cut the leaves into strips approximately 1 inch wide. Cut across the veins in the leaf, as these are the toughest parts. Trim the base of the stem so that you remove the vestiges of the roots. Cut the stem at an angle (which increases the surface area of each slice and helps them cook quicker) into discs approximately 1/4 inch thick. The leaves and stem cook at different speeds; the leaves take less time to cook, so add them toward the end of cooking. Chopping the leaves is easier if you roll them up first and then slice across them. Remember when cutting any vegetable to keep the tips of your fingers on the hand holding the vegetable slightly curled away from the knife to avoid injury.